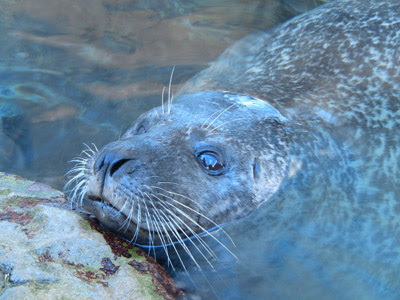 Come take a dip with the harbor seals! This summer, the New England Aquarium is letting visitors get closer than ever to the animals. Not only can you touch shark and rays at the Aquarium's new touch tank, but now you can put on a pair of waders and hop into the harbor seals exhibit! We're happy to announce a brand new program for visitors to add to their Aquarium visit. We're calling it "Take a Dip with the Harbor Seals." So what happens in the program? Here are the details. 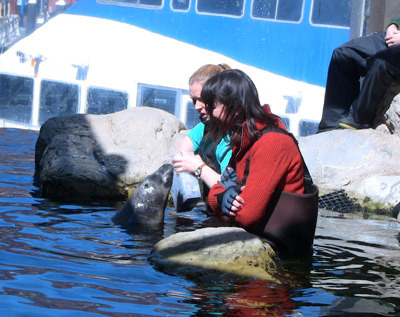 Visitors can sit waist deep in the water with the harbor seals at your fingertips! 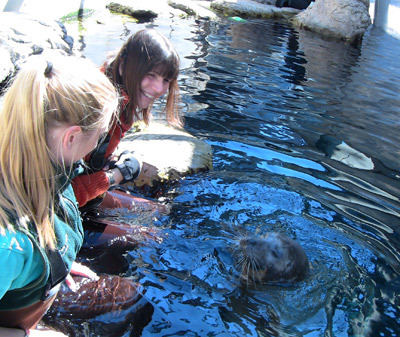 Being in the water is a unique and exciting way to learn about our harbor seals. 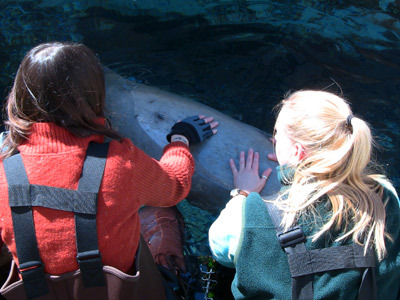 The participant is escorted behind the scenes of the Harbor Seal Exhibit by a trainer or volunteer. They are briefed on what will occur during the session and how to safely interact with the seals. Then the participant puts on water proof waders and enter the exhibit area with the trainer. They step into the water and sit on a flat rock so they are waist deep in the water with their feet hanging over the edge of the rock. Then the trainer calls the seal over and the interaction begins. You will be eye to eye with the seal, and may have the opportunity to give a belly rub, touch a flipper, feed the seal some fish and perhaps even get a kiss. During this program the trainer will point out some of the harbor seal's unique characteristics and what to do if you come across a seal on the beach, or while fishing or boating. We can't guarantee specific interactions, but these are examples of some that may be offered on any particular day. So are you ready to come hang out with the seals? Get the program specifics here.